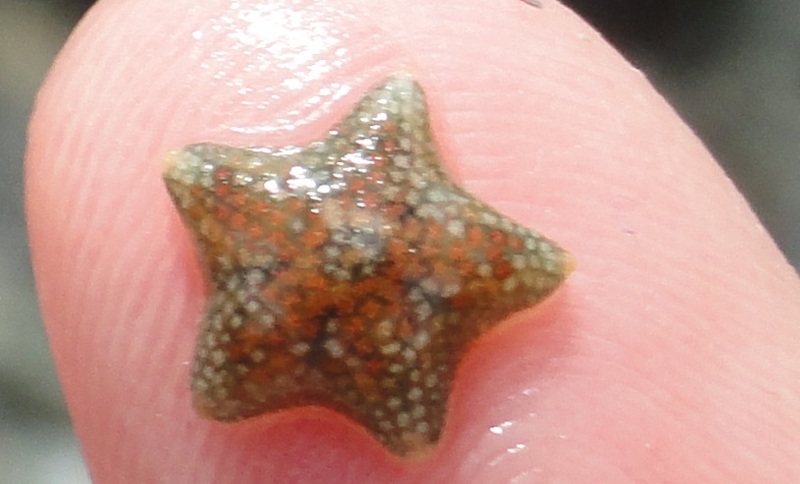 It’s been a great summer for finding starfish. All season I’ve been taking snaps of giant spiny starfish and watching brittle stars walk across the sea bed. I’ve placed cushion stars into eager palms, enjoying the giggles as children feel tickly tentacle-feet for the first time. I’ve looked through hand lenses at the kaleidoscope colours of the tiny Asterina phylcatica starfish and I’ve seen some fantastic photos of seven-armed starfish found in Cornish rock pools. It was only a few days ago I realised something was missing. I haven’t seen a Common starfish all summer. Common starfish are abundant in the waters around the Cornish coast and young starfish are normally a frequent sight in our rockpools and tidal overhangs. They’re a beautiful animal, their bright orange colour is what most people associate with the word ‘starfish’. They’re related to the other starfish species I mentioned above and also to other spiny skinned creatures (echinoderms) such as sea urchins and sea cucumbers (but definitely not to fish). Last summer I recorded at least one on nearly every survey I did. This summer there are none. A quick check with some experts in the local area soon revealed that they hadn’t seen Common starfish all season either. Why have they disappeared from our rock pools? First of all, there’s no need to panic. Populations of some marine animals, including starfish, can fluctuate significantly without there being any cause for concern. This is especially true in the zone between the tides, which is exposed to all sorts of temporary changes. The common starfish can be dislodged from rocks and killed by powerful waves and currents. This affects intertidal and shallow populations the most as these are most exposed to the waves. This could easily explain their absence because the winter of 2013/14 was exceptionally stormy. 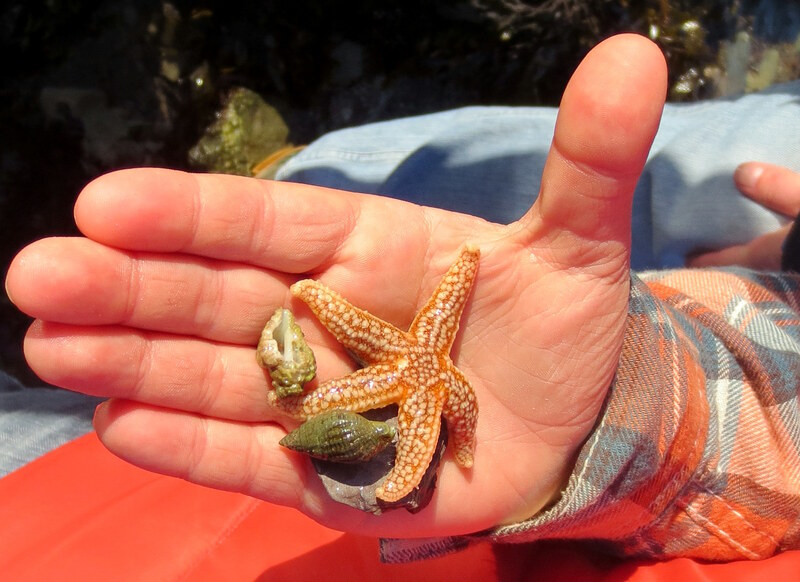 The summer of 2014 has been warm and sunny and there have been lots of reports of bathing waters reaching 20 degrees C. The Common starfish generally lives offshore where temperatures are relatively constant. They may not survive or choose to move inshore to warm waters, so this may be why they’re not in the rockpools. There is no evidence to suggest that this change has been caused by disease. To my knowledge no-one has come across diseased animals or large unexplained strandings of starfish – although some strandings have occurred after storms. In the USA, however, disease has ravaged the populations of certain species of starfish and other echinoderms, causing sudden collapses in local populations. This started on the Pacific coast, but has recently moved to the Atlantic coast. Experts in the USA are warning us all to be vigilant. If you notice starfish with white lesions or large strandings of animals, please do take photos and let your local Wildlife Trust know. Of course, disease would be terrible, but in some ways the other possible explanations are just as worrying. Climate change is already having an effect on our oceans. If water temperatures increase and extreme weather becomes more intense and frequent then we may see these changes more often. Tackling climate change is a priority if you care about our marine environment. Will the Common starfish come back? Yes. Populations of Common starfish in deeper waters will be much less affected by changing temperatures and stormy conditions. Over time, this species will reappear in our rockpools. Even in areas hit by disease, there has been some recovery between outbreaks. The temporary disappearance of the Common starfish has reminded me of how important it is to record what we see on the shore. We need good data to help us monitor change. The great thing is that, in Cornwall, everyone can help by visiting and sharing what you have seen at the beach with the Cornwall Wildlife Trust. In other areas visit your local Wildlife Trust website. In today’s changing and challenging world, wildlife recording is more important than ever. Great article, I was worried about the starfish, and then I calmed down. I do require a report the second you see one again, otherwise I will be just as worried as when one of my cats does a walk about for a couple of days. Thank you, Amanda. I was worried when I noticed the change and I’m speaking with divers and fishermen to hopefully confirm that the starfish populations are still healthy in deeper waters. This species prefers the open ocean to rockpools – in the same way that cats prefer a field of long grass to a lovingly made cat-bed. Chances are they’ll re-appear when the conditions suit them better.